From the visionary mind of Matt Wagner, the world of Grendel returns with two value-priced omnibus volumes collecting all Grendel Tales stories! 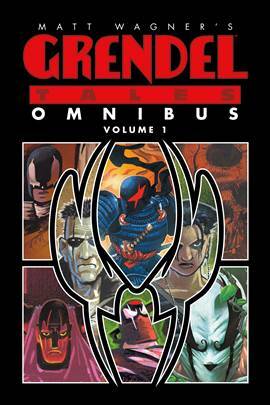 Featuring some of the best writers and artists in the industry and never-before-collected material, Grendel Tales Omnibus Volume 1 is sure to be a hit with longtime fans of this iconic character or newcomers just discovering Wagner's strange, dystopian future, where the angry spirit of Grendel is part of everyone's lives! With over 400 pages of story and art to enjoy and all cover work reproduced, Dark Horse is proud to present the Grendel Tales Omnibus collections!